Food festivals: Enjoy the feast! My mother can’t stop talking about it! She visited Calabria five years ago, and when friends took her out to dinner in one of the villages near Scigliano, she ordered a mushroom dish. I still haven’t heard the end of it. Sadly for all of us, we do not have the recipe. But the season for mushrooms is approaching, and they will be celebrated in the Italian south. In the Sila, the mountains of Calabria, the village of Camigliatello Silano celebrates a wild mushroom festival each year. In Diamante, the chili pepper takes center stage. Chestnut festivals are common throughout Italy, but the village of Zafferana Etnea in Sicily goes one better, celebrating a Chestnut and Wine Festival. Eggplant, pasta, sausage, chocolate–it seems like most any food in the cupboard has a festival in its honor. But we were talking about mushrooms. In Marcella Hazan’s “Essentials of Classic Italian Cooking” I found this recipe that pays homage to the mushroom. To prepare the dried porcini mushrooms, soak in two cups of barely warm water for at least 30 minutes. Lift the mushrooms by hand, squeezing out as much water as possible, and let the water flow back into the container in which it has been soaking. Retain the water, and rinse the mushrooms in fresh water, scraping any spots where soil is embedded. Pat dry with paper towels , and chop. Filter the soaking water through a paper towel or coffee filter, and retain until called for. Trim, wash, and towel dry the fresh mushrooms and cut in half or quarters lengthwise, keeping the caps attached to stems. Choose a saute pan that will contain all the ingredients loosely. Start with oil and garlic heated to medium high until the garlic becomes pale gold. Add rosemary and the reconstituted porcini. Stir once or twice to coat well, then add the filtered water from soaking the mushrooms. Turn up the heat and cook at a lively pace until all the water has simmered away. Add the cut up fresh mushrooms to the pan, together with salt and pepper, turn the heat to high, and cook, stirring frequently, until the liquid shed by the fresh mushrooms has simmered away. Add the tomatoes with their juice, toss thoroughly to coat well, cover the pan, and turn the heat to low. Cook about ten minutes. If needed to prevent sticking, add one or two tablespoons of water to the pan. When done, serve immediately. 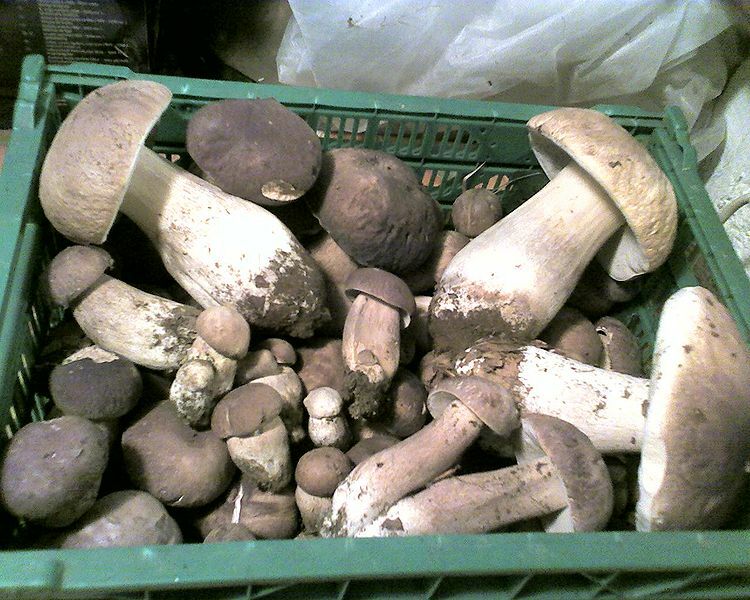 This entry was posted in Food and tagged Calabria, cooking, food, Italy, Marcella Hazan, mushrooms, porcini, scigliano. Bookmark the permalink. ← Mille grazie! You made my day. I don’t even really like mushrooms and I want to taste this. Today, your work is mouth-watering!